It seems like crime shows always call on a specialist to scour a crime scene for trace evidence or testify as an expert witness in court. While real forensic science work lacks a sinister soundtrack, professionals in this field do play a vital role in the criminal justice system. Read on to discover the many ways that people interested in a forensic science degree can delve into investigative crime work. As the number of eateries in need of experienced and capable leaders has increased in recent years, so too has the popularity of restaurant management degree programs has increased to meet these needs. Whether a student is studying in person or online, there are countless schools throughout the country ready to prepare them for a successful career in restaurant management. It can be frustrating trying to find the best programs, which is why we’ve done the work for you. Below, you’ll find a list of the best restaurant management programs based on the school’s cost, graduation rate, and even their class size. Check out these top-ranking schools for 2017 and get started on your restaurant management program. There are many different career paths within the forensic science field. For example, individuals who participate in criminal investigations may engage with crime scenes, toxicology lab work, criminal pathology, or post-mortem medical examinations, depending on their specialty. They provide scientifically verifiable facts and well-supported, unbiased opinions that help deliver impartial justice. Their job requires precision and detail, crossing between the lab, interview rooms, and the court. field depend on local crime levels. For those who want to participate in the criminal justice system but are not interested in hands-on crime scene work and extensive laboratory testing, there are other education paths that prepare students for investigative or legal work. Degrees in criminal justice explore various aspects of crime, the law, and the justice system. A degree in this field opens up opportunities to work as a private investigator or law enforcement officer; a government agent; court and legal personnel; or in areas of crime-related prevention and support, such as victim help centers or substance abuse programs. A computer science degree program explores hardware, software, and networks. Computer forensics is a sub-discipline that helps expose criminal activity carried out using technology and establish a solid case based on computer and online evidence. Undergraduate law programs prepare students for paralegal careers assisting lawyers and conducting legal research. Advanced law degrees explore the U.S. judicial system and legal theory, preparing students to pass the bar exam and practice law as full attorneys. The first thing students may notice when researching degree programs is that forensic science fits into different departments depending on the school: chemistry, biology, psychology, or criminal justice. The varied departments reflect the varied job paths possible with a forensic science degree. Generally, students spend undergraduate years finding the area of forensic science that suits them best, while graduate programs are dedicated to narrowing a student’s focus to become an expert capable of testifying in court. An associate degree in forensic science exposes students to the range of topics they can pursue. Classes provide general education, transferable credits, and career preparation. An associate degree is a way to gauge what a student is interested in pursuing, and explore a range of options. There may be different departments supporting a forensic science associate degree: one as an associate in arts and one as an associate in science. Forensic science degrees in the arts explore social, behavior, and psychological classes, while forensic science degrees in science focus on chemistry, biology, and physics. Since an associate degree in forensic science is designed to prepare students for further education, students are required to take general education classes. The following classes typically form the basic knowledge base for a forensic science associate degree. Introduces criminal investigation procedures, including specific investigation tactics for selected offenses, questioning techniques for witnesses and suspects, and common problems in criminal investigations. Students learn to recognize, identify, and evaluate physical evidence, and study the role forensic science plays in modern criminal investigations. Teaches the fundamental principles of chemistry, including the structure of matter, formulas and equations, chemical bonding, and the periodic table. Introduces the role of the expert witness and proper procedures for handling evidence. It also explores major laboratory techniques in processing evidence. A bachelor’s degree in forensic science combines science and law; students explore biology, physics and chemistry as well as criminal justice. Bachelor’s students should know what area of forensic science they wish to focus in, and have some background classes or experience in that area. Bachelor’s degree programs in forensic science prepare students for entry-level positions and for careers in criminal justice and science. Some programs have separate degree tracks for students wishing to specialize in chemistry or biology, and graduates may go on to medical school or graduate forensic science studies. Students learn how alleged matters are established or disproved. Emphasizes foundations of courtroom testimony, witness examination, dying declarations, and confessions. An introductory class on what dangerous substances do to living organisms. Topics include the biochemistry of toxic substances within the body, hazards and methods of handling toxic substances, and treatment of their effects. Covers criminal and scientific investigation tactics associated with suspicious fires, including social, psychological and environmental factors associated with arson. Teaches the basic techniques and principals used to document, preserve, and collect physical evidence at crime scenes. Applicants for a master’s in forensic science program range from current legal professionals and criminal investigators looking to upgrade their existing skills, to students interested in pursuing a specialized career in the medical or legal fields of criminal justice. Students learn communication skills, current forensic science techniques in the field and in the lab, and greater intricacies of the law and the court system. Programs require laboratory experience, and some programs expect students to have an undergraduate degree in a laboratory science. Graduates can confidently handle crime scene procedures, legal proceedings, profiling, computer and multimedia forensics, and scientific research methodology. Graduate degrees help students specialize even further and develop specific skills that they can use in the forensic science field. The following are some advanced classes in forensic science that students may take, depending on their interests. Teaches the fundamentals of human anatomy and physiology, particularly the form and function of the human body. Explores the principals and methods of physical examinations and analysis of trace evidence (such as hair, soil, and fingerprints). Students also learn about the chain of custody and how to serve as expert witnesses in a trial. Students learn about forensic identification and analysis. They compare biological evidence samples using various tactics, from electrophoresis to DNA extraction and purification procedures. Explores how to apply forensic anthropology in a medicolegal setting. Students learn techniques for recovering and identifying individuals, interpreting skeletal features for a biological profile, and determining cause of death from skeletal trauma. While chemistry and biology classes are essential components of forensic science degrees, the field requires students to analyze human interactions and psychological principles as well. Understanding how other people think and how to communicate effectively are essential abilities that good programs cultivate in their students. Because forensic science degrees lead to hands-on careers, it is important for students to spend time in labs and in the field. There are strict legal and scientific procedures to follow, and any chance to practice in a professional setting can help prepare students for real world situations. Forensic science relies heavily on biology and chemistry. Testing substances and analyzing trace evidence is a key part of the job, and learning to use state-of-the-art laboratory technology develops these skills. Students should look for forensic science associate degree programs with accreditation from The Higher Learning Commission. Bachelor’s and graduate degree programs should be accredited by the Forensic Science Education Programs Accreditation Commission. This society evaluates forensic science programs for their quality and research value to the field. The criminal justice system requires employees involved in investigations to testify in court. As a forensic expert, you may be called upon to speak knowledgeably on findings or evidence. Degree programs should prepare students with public speaking tactics and standard courtroom procedures. Professionals in the forensic science field function in many areas of the criminal justice system, and students in the early stages of a degree program are often encouraged to delve into several different aspects of the field to find what area interests them most. Narrowing focus to one area should only be necessary in the later stages of a bachelor’s degree or graduate program. 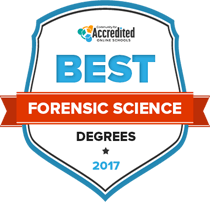 Earning a degree in forensic science opens students up to careers across the criminal justice and forensic science spectrum. Explore possible career paths below with information on salary, projected job growth, and the typical education to enter the field. Most forensic science technicians and crime scene investigators are employed in local or state governments. They are in charge of collecting, identifying, classifying, and analyzing physical evidence to determine its relevance to a criminal investigation. They may specialize in areas such as ballistics, fingerprinting, handwriting, or biochemistry, and serve as expert witnesses in these areas for court cases. While laboratory forensic science technicians typically work standard hours, crime scene investigators may work extended or unusual hours and travel to crime scenes within their jurisdiction. Description: Forensic pathologists and medical examiners are required to perform autopsies, assist in investigations of suspicious deaths, and offer an objective, expert opinion in court. Most medical examiners undergo 14 years of education, including four years of medical school and five years of residency training in anatomical and clinical pathology. Employers require a doctorate degree as well as clinical or forensic pathology certification. Overall, their salaries and hours may depend on local crime levels. Description: Information security analysts protect an organization’s computer networks and systems. They plan, upgrade, and monitor technological security measures, and prevent cyberattacks. Information security analysts work for computer companies, consulting firms, and business and financial companies. In the role of computer forensics analysts, they investigate security breaches and recover data. They may also give expert counsel about electronic evidence or train law enforcement officers in computer evidence procedures. Forensic science professionals must evaluate evidence without bias. They back their conclusions up with facts based on extensive testing, knowledge, and experience. They must also demonstrate integrity as they carry out their duties. Dealing with evidence, crime scenes, suspects, and law enforcement is an essential part of forensic science careers. You should be familiar with laws, legal codes, government regulations, court procedures, agency rules, and the justice system’s processes. As expert witnesses and specialists, those in the forensic science field will have to testify in court. They must be professional, speak clearly and confidently, and support all of their conclusions with evidence. A job within forensic science requires being able to find the little details that can support larger theories. From a handwriting loop to a fleck of blood, any shred of evidence could be crucial to solving a case. Many forensic science jobs require lab work and chemical testing. This could be to trace evidence, analyze DNA, or investigate unknown or toxic substances. Forensic science professionals should know chemical compositions and interactions, production techniques, signs that a substance is dangerous, and proper disposal methods. Forensic science workers deal with lots of sensitive information. As a result, careers in forensic science demand a high level of trust, professionalism, and ethics. Employers perform extensive background checks that review arrest and conviction records, alcohol and drug screenings, credit reports, interviews with acquaintances or friends, and/or polygraph testing.